Imagine a workday like this. You wake up in a beautiful location. 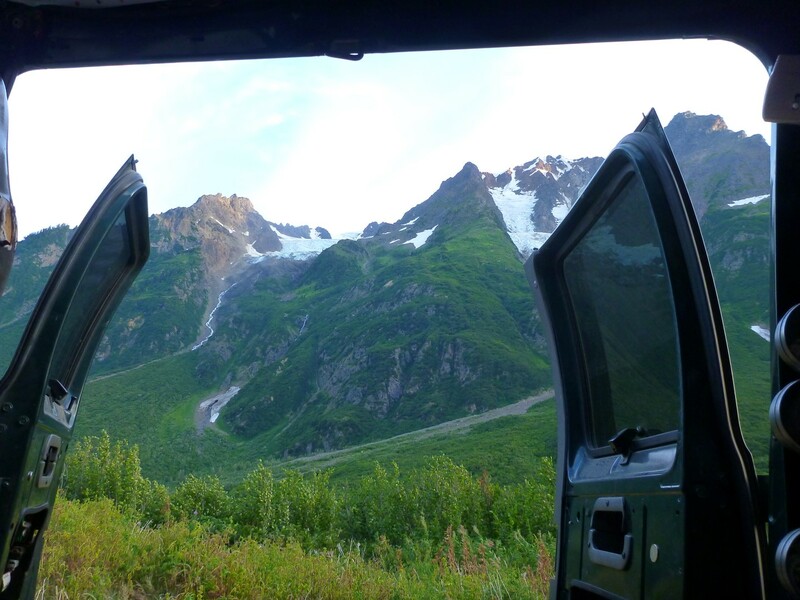 You look out the window at the sun coming up over several layers of forested mountains. You’re parked right next to a quiet lake and can see small fish jumping, creating concentric circles on the flat surface of the water in the soft morning light. You don’t need an alarm clock because the light streaming through the windows signals that it’s time to wake up and begin another joyful, productive day of work. You get up, make coffee and get to work immediately on your laptop in your camp chair. There are no distractions here, no co-workers to come over and ask about your weekend, your favorite sporting team, or to describe their cat’s recent, fascinating activities. There is no commute. There is also no complicated routine involving fancy clothing, make up or hair styling. Because work begins at 7 AM, the afternoon is free for biking, climbing, reading or just relaxing. This is the remote work lifestyle I’ve been enjoying for over 3 years. I feel extremely fortunate to have such freedom and because of the perks this job offers, I am a very loyal employee. 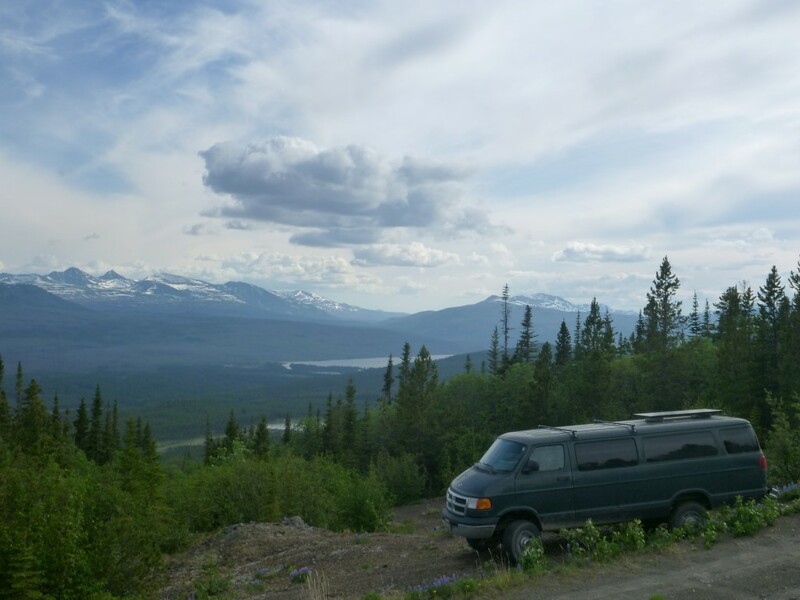 I have an office and go there occasionally but usually I just work from the van in beautiful, remote locations with good cell service. 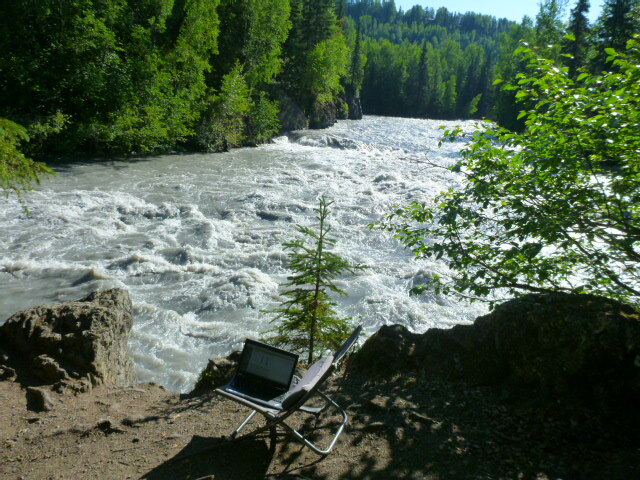 Some of my favorite places to work have been right next to a roaring rapid at my campsite in Alaska, or next to a river in Idaho where kayakers paddled by as Brian and I sat there working on our laptops. Over the summer, I spent 7 weeks on a remote work trip in Alaska, British Columbia and the Yukon. This camp along the Virgin River Gorge in Southern Utah was one of the finest ever, with both roadrunner and coyote sightings (at different times) and a great mountain bike trail, the Jem Trail, right across the river. We stayed here in late October when the weather was glorious and the trees were bright with fall colors. How is this lifestyle possible, when a full time job seems analogous to being chained to a desk, or confined to an inhumane cubicle for at least 40 hours per week? It’s possible because working remotely is the best situation for both my employer and myself. 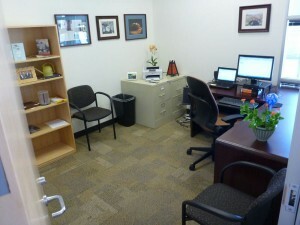 The alternative is hunkering down in a cubicle or office to produce software 40-80 hours per week. I know how that feels because I did it for a decade. Often I wasn’t as productive as I could have been. The working conditions were sometimes dark, distracting or otherwise uncomfortable. Food (and other) smells drift through the air in a sea of cubicles. A co-worker’s family drama can permeate the work environment as sounds of children being disciplined by phone are overheard. 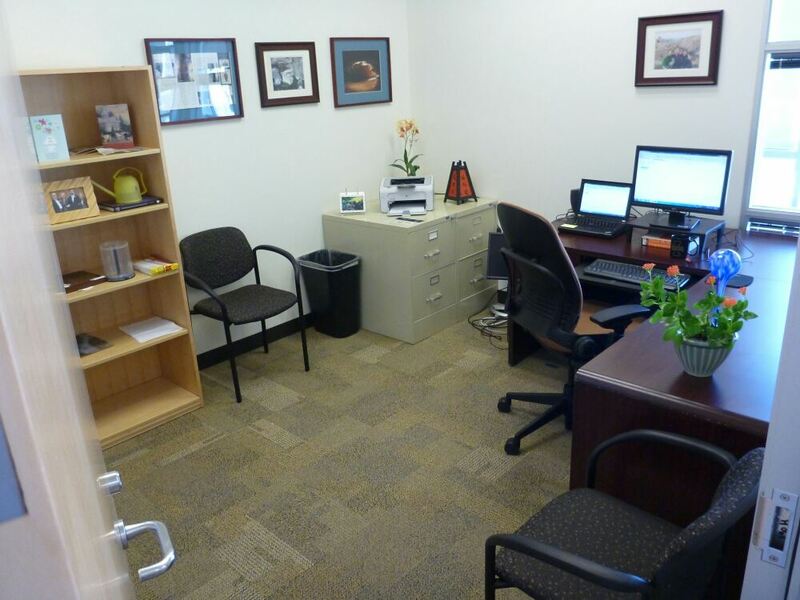 The office can be a very social place, with co-workers stopping by to chat on a regular basis, either with you or with the people around you. Even in this wonderful office I have at my current job, distractions are numerous. Even when I close the door, I see people walking by and overhear conversations outside my office. Each time a programmer is distracted from concentrating on a technical task, it will take at least 10 minutes to return to full concentration and productivity. Imagine this happening once or twice each hour, and you can see why programming productivity is greatly reduced in an office environment. Although some programmers thrive on the collaborative environment of an office, some may find themselves many times more productive when working independently. It just makes sense to offer a programmer peace and solitude to concentrate on technical tasks and create quality software products. It can make the programmer happier and easier to retain, too. These are the reasons programming can work well with a remote lifestyle when the programmer is able to work autonomously. How can you convince your employer to let you do this? First, pay your dues by working at least a couple years in your position. At least, that’s what I did before I was granted permission to work remotely. Get really good at your job. Your level of remote work freedom will be directly proportional to your talent, the value you add and the level of dependence your employer has on your fine work. Make yourself indispensable and the remote work lifestyle becomes easier to negotiate. With one or two great performance reviews under your belt, it’s completely reasonable to request a trial period where you will work remotely for say, two weeks. During this trial period, you are going to work very hard on something that will delight your employer. Or just try to increase your productivity noticeably. You’ll want to prove this lifestyle works for you and that it’s in everyone’s best interest to allow you to continue this way, free from the distractions of the office. You may need to come in for an occasional meeting, but for the most part you are free to travel and work via a laptop and smartphone with Wi-Fi. Why not? Communication via email and phone is usually sufficient and in-person meetings can be scheduled when they are needed. I’ve been at my current job as a senior programmer at a University nearly eight years, and the ability to work remotely has been one of the major factors in staying this long. On my last performance review I received the highest rating, excellent. The remote lifestyle works! Not all jobs are suited for this, but many computer programming positions certainly are. I’m surprised more coders don’t pursue remote work situations. Adventurous people who are interested in a nomadic lifestyle may want to consider a career in computer programming. After all, just look at the places we’ve lived and worked. This is the best job ever. I had grown a little tired of my solo hikes. I wanted to do something challenging and push my limits with other people around. I just feel more relaxed knowing there are others on the trail who can help if I have a problem. 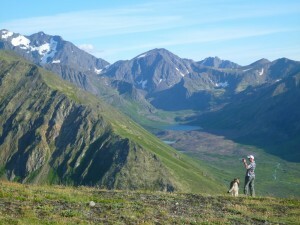 When I saw a “Heart and Lunger Hike” on the Anchorage Adventurers meetup website, I began planning my week around it. 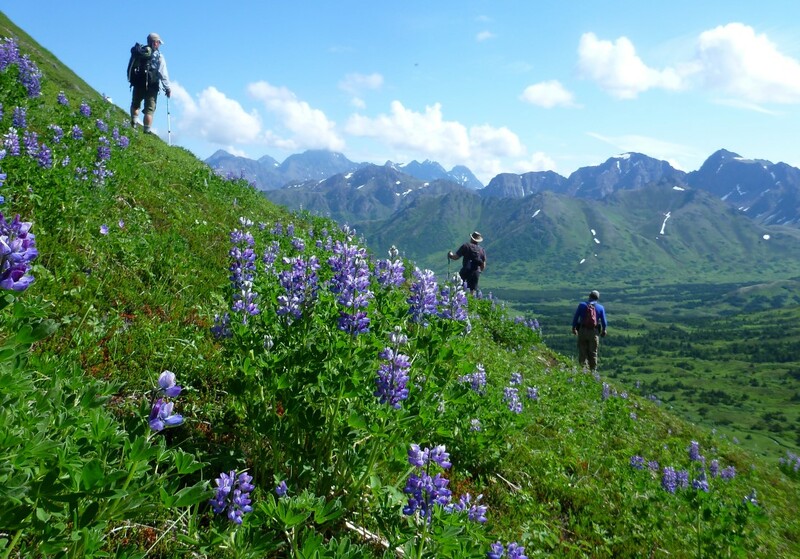 These “Heart and Lunger” hikes have been a tradition in Anchorage every Tuesday night since 2007. The extreme outdoor culture of Alaska ensures these grueling hikes would attract a dedicated following. I showed up for the hike and sure enough, 11 very cool Alaskans appeared at the bottom of the mountain. There was little small talk. It seemed that they were mostly there for the hike, not necessarily to make new friends. We started up the mountain. I’m used to climbing peaks but these ultra-fit Alaskans left me in the dust in about 30 minutes. After the first 30 minutes, I only saw one man and his dog at certain points during the hike. The description of the hike was accurate. It went straight up the side of a beautiful mountain. Had the wind been blowing hard, I would have crawled to the summit. Conditions were calm and beautiful, so I just slowly picked my way up the steep, loose rock. At the summit, I examined the rocky, steep route along a ridge the others had already started down and saw their colorful shirts far in the distance. The route looked pretty difficult so I decided to descend the same way I came up, solo again. I felt OK about it. This trip has stretched my comfort limits over and over again for what I’m willing to tackle solo. When I got to the parking lot at the bottom after the hike, I found a couple people had waited to make sure I made it down. They were caring people, but were not about to slow the pace of their heart and lunger hike to wait for me. After the challenging backpacking and peak bagging trip and this heart and lunger hike, I was pretty impressed with the Alaskans and their meetups. I love meetups (www.meetup.com). I’ve been going for years and have even organized a few. A meetup involves signing up for an activity online and then sharing that activity with total strangers. In my experience, meetups attract friendly people with positive expectations. People who don’t like other people, or are paranoid about doing an activity with strangers won’t last long in a meetup group. I found a great meetup group in Alaska called the Anchorage Adventurers. The first meetup was very challenging and took place in a spectacular area I would have never found on my own. 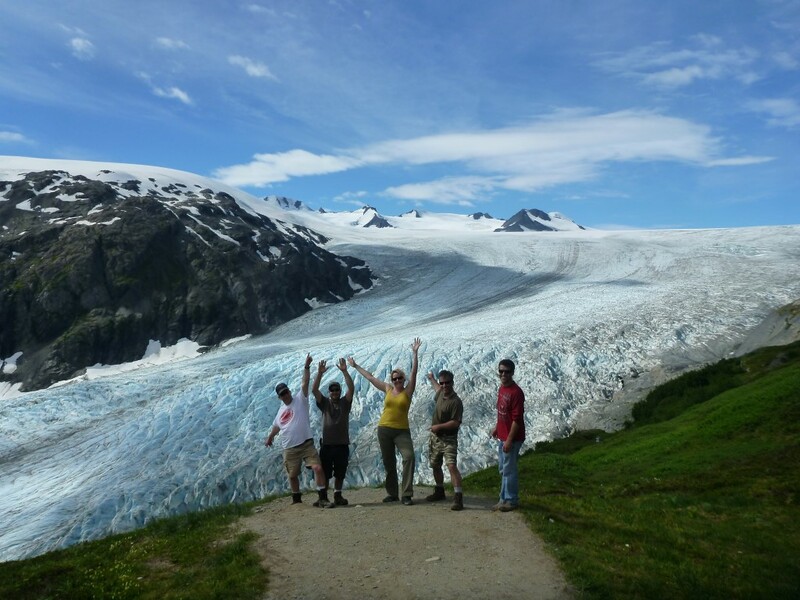 I was shocked these types of dangerous and grueling experiences would be open to me as a tourist, but these Alaskan meetupers quickly welcomed me into the fold and I was then hammered on three epic meetups with them. 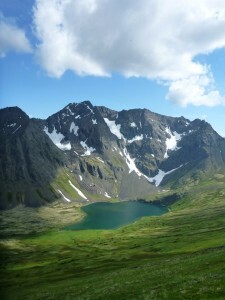 My first meetup was a weekend backpacking and peak bagging trip in the Chugach Range near Anchorage. It looked like it may be beyond my abilities, but hey, it’s a meetup where strangers are welcome. How hard can it be? Also, it was the weekend of my birthday and I was travelling solo. I wanted to do something exciting for my birthday. I showed up for the meetup on a Friday afternoon at the Glen Alps Trailhead, only 20 minutes from downtown Anchorage. Most of the meetupers had already backpacked to Hidden Lake, a beautiful, blue lake in a rocky bowl above tree line. The organizer and I backpacked in together, just the two of us. She was an extremely fit mountaineer and I hurried to keep up during the five mile hike into the lake. She nonchalantly pointed out a moose browsing on foliage right near the trail, and I was thankful I wasn’t doing this hike solo. As soon as we got to the mountain lake, we stripped and took a quick dip in the cold water in the soft glow of the evening Alaska sun. I needed some convincing because the lake was very cold, but after the organizer convinced me to plunge into the water I felt like I had become more of a member of the group and less of an outsider as I emerged naked and shivering from this lake in their backyard playground. All of them lived in Anchorage and I was the only tourist. I asked the organizer about the next day’s plans, and she pointed to several technical peaks around camp which required climbing skills and looked far above my ability level. The organizer just shrugged and said “if the goats can get there, so can we”, and she announced she would just solo the peaks if no one wanted to come along. I asked if I could join four of the other meetupers on the trip, who planned to attempt a peak several miles away. It would be a long, grueling day but would not involve any exposed climbing. They said, sure! We all set up tents and found a cooking and eating area on a hillside nearby. The Alaskans were pretty casual about bears and food. I started to feel my tourist bearanoia wearing off as they decided to just leave food in their old drybags (with small holes in them, even) right there on the side of the hill as they slept 100 yards away. One person just kept his food in his tent that night, and no one thought that was unusual. They talked about recent bear sightings at the lake just below us, but showed no signs of worry. There wasn’t a single bear canister in the group. I felt delighted to observe these Alaskans and kept silent about the food storage. Sure enough, the next morning all the food was intact. We ate breakfast on the hillside as the organizer left to solo the peaks around camp, waving at us as her bright pink shirt got smaller and smaller as she quickly gained elevation. The rest of us started out toward Williwaw Peak. 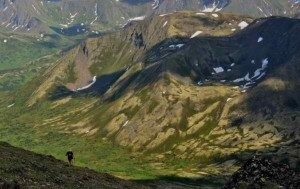 We hiked off trail on slopes covered in tundra, which felt like a colorful sponge under my feet with reds, greens and golds intertwining into a dense, soft mat. This tundra was an amazing hiking surface as well as beautiful. Even 40 degree slopes were incredibly stable and every foot hold felt good as we went up a steep pass and over the other side to enter the valley which would lead to our peak. 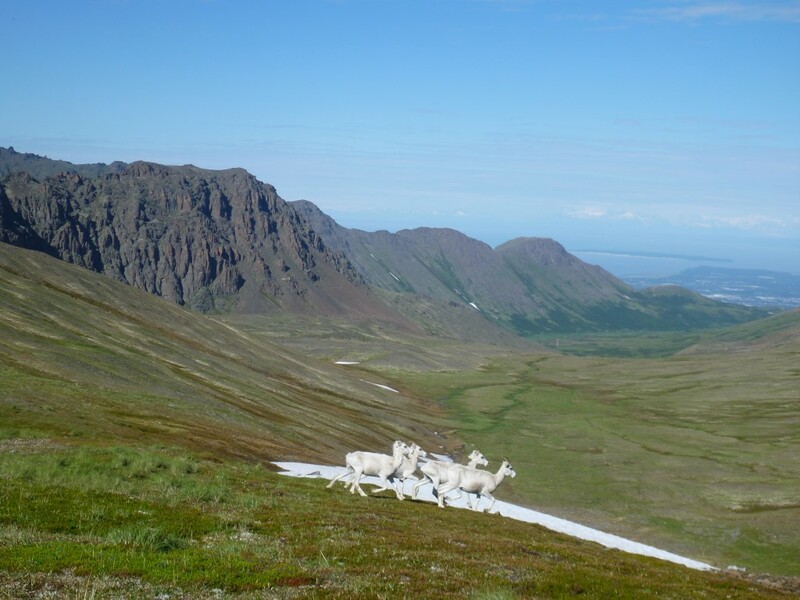 At the top of the pass, five mountain sheep approached us timidly. They stood just 30 feet away and seemed to be making some kind of silent decision. We stood absolutely still as they galloped right around us, only 15 feet away. We stood together as a group, breathless with cameras clicking. Maybe we just happened to be at the pass at the time when they usually cross, around 11 am, and they didn’t care to have their schedule disrupted just because we decided to hike that day. We went on to attempt the peak but no one made the summit. 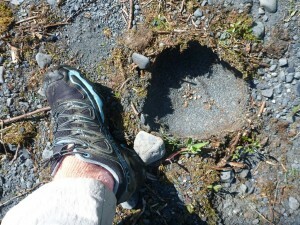 After hours of side hill hiking on the way to the peak in trail runners, my feet began to blister badly on one side. They were not used to this terrain. Another man in the group said his ankle was bothering him and the summit was still a very long way to go. We turned back and stopped to soak our feet and lounge on the soft tundra at a spectacular lake on the way back to camp. 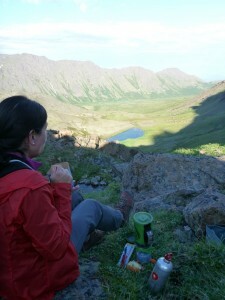 We arrived in camp and enjoyed a leisurely dinner. The organizer returned with a big smile on her face, still bouncing with energy. The other two people from our peak bagging group still hadn’t arrived. As dark approached they stumbled back into camp. One was saying things that made no sense and the other was very sick and vomiting. We offered them food and water, but they stumbled to their tents to recover and neither one of them was seen for the rest of the evening. I had never experienced such a challenging meetup, anywhere, anytime. This meetup group showcased Alaska outdoor culture at its finest, and I couldn’t wait for more. 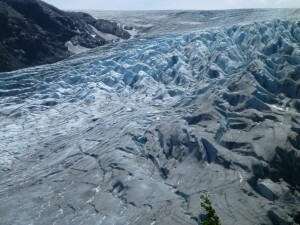 The Harding Ice Field hike was high on my list. 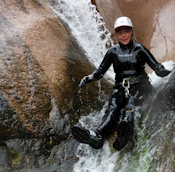 It’s a challenging, visually stunning, day hike in a popular tourist area. This is my favorite type of solo adventure. I love a challenging hike, but when I’m by myself and doing something difficult I feel more secure knowing other people are hiking the trail and can call 911 if I happen to break myself. I said hello to plenty of people on the trail as they passed me and I passed them. There were so many people around that I felt a little silly about my standard practice of calling out “Hello?” in a loud voice every few minutes so I don’t surprise an animal. I fell into a confident rythym of quiet hiking and then it happened. I rounded a corner and right there in the middle of the trail was a medium sized black bear. He was only 30 feet away and suddenly my very worst fear about solo hiking in Alaska was staring me in the face. I had surprised a bear and now he was incredibly close and looking right at me. He could charge, attack, do nothing, and I had no idea what was going through his little bear brain. I was frozen with fear for several seconds. I can still picture the bear’s cute little face in my mind’s eye with his humble and lazy expression. His fur was a very dark brown and he had light tan markings around his face. His body language told me he didn’t have an ounce of threat in him but my heart was still beating incredibly fast. I backed up around the corner, grasping my large canister of pepper spray, panting with fear. I waited a few moments and some hikers came up behind me. I told them what I had seen and their eyes got wide and they also grabbed their canisters of spray. I was so happy to have them there. 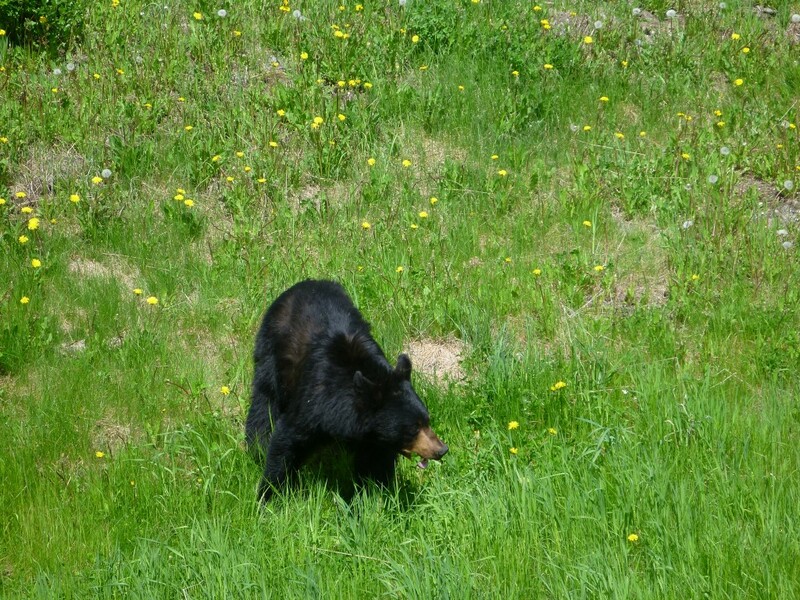 We called out “hello mister bear” and other silly phrases until we heard him crashing through the brush below. The trail was safe now. We proceeded. Now I was a mini-celebrity on the trail. Everyone wanted to know what the bear looked like, how he acted when he noticed me. How big was he? Black or Grizzly? Did he look aggressive? How close did you get to him? I have to admit, I was eating up the attention having been immersed in pretty much total solitude for several days beforehand. I started to hike with a group of brothers from Minnesota after they quizzed me about the bear. They were a great group with great energy and I immediately felt like part of the family. I wish they were facebookers so I could have kept in touch with them. 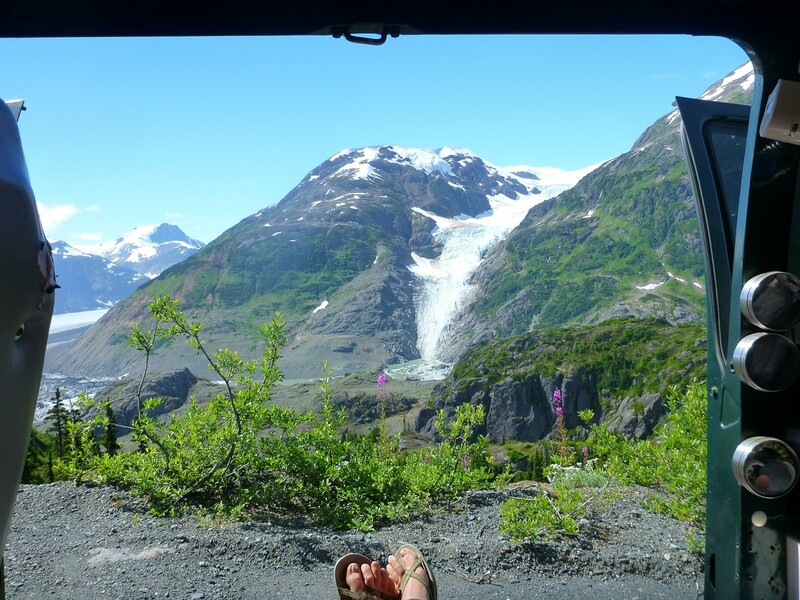 At least I got a great photo of us at one of the lower viewpoints of Exit Glacier. I greatly enjoyed their company. When we got to the steeper ascent above treeline I looked behind me to see them far behind, sitting down for a break. I kept going, solo again. I wasn’t alone for long. I met an awesome couple from New York and we enjoyed the rest of the hike together. They were so cute. Her name was Lisa too, but her partner used her nickname, “monster”, so there was never any confusion. 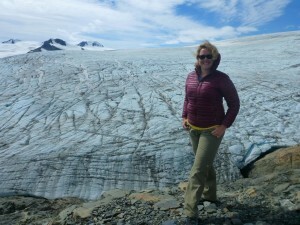 She used a big, nice camera to capture the visually stunning glacier and I had fun posing for some photos. She’s an artist and he’s an engineer for Google so we had a lot to talk about. 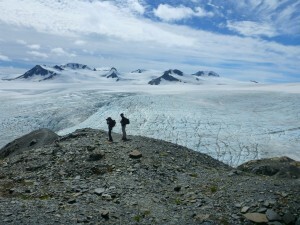 We reached the very high point of the trail and gazed across the Harding Ice Field. This has to be one of the most amazing sites in Alaska that can be reached by foot in a day. 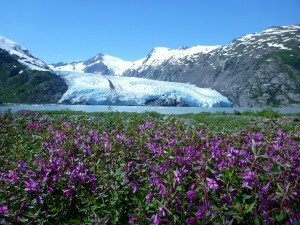 The Harding Ice Field feeds several glaciers which continue to carve out the deep fiords of Kenai Fiords National Park. It all starts here at this enormous Ice Field, shimmering under beautiful blue skies with the occasional shadow of a cloud racing across its surface. 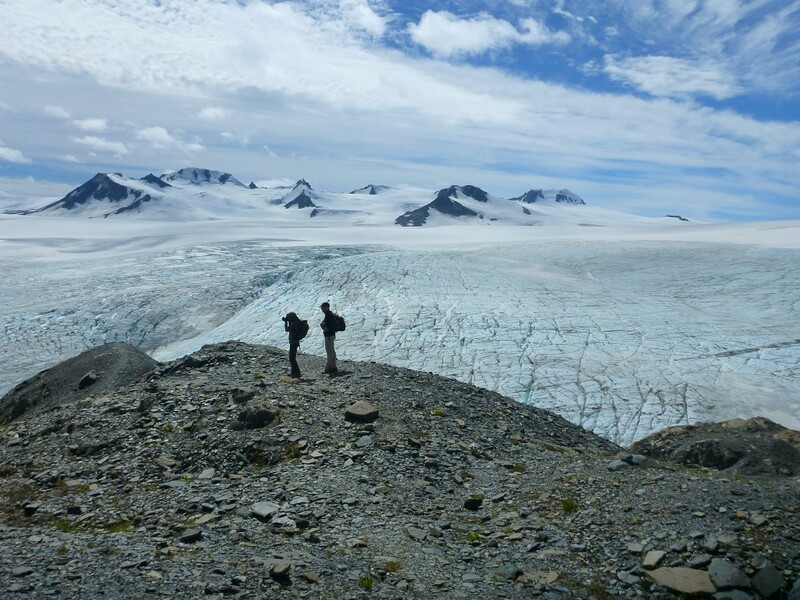 We admire harding Ice Field from the top of the trail, then started seeing a steep foot path down to the side of Exit glacier. I’m happy I can push the envelope on this steep, sketchy descent with the comfort and company of my new adventurous friends. We make our way down to a spot in front of the blue, grey and white striped ice and enjoy a lunch break there. It’s COLD right next to the glacier and we all find ourselves putting on the extra layers in our packs even though we were sweating on the ascent. 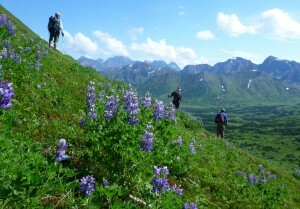 We all agree this is the best hike yet in Alaska. Monster snaps at least 50 photos during the lunch break. 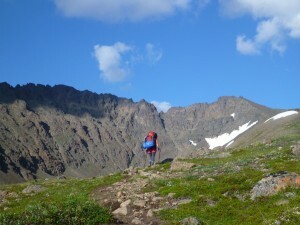 We descend the trail with lively conversation, plenty of photo breaks and no bear sightings. When we get to the parking lot, I give them the tour of my van and lifestyle. We hug, part ways, and I feel filled with the love of all the people I hiked with that day. I also treasure the bear sighting. It’s something I both dreaded and hoped for during my time in Alaska, and it felt just as exciting as I thought it would, especially from such a close range. I go into the town of Seward and explore camping options. 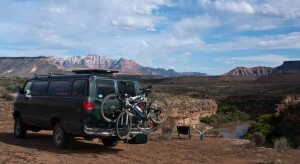 People are crowded into a waterside area in RVs and the view is gorgeous across the ocean to dramatic peaks, but there is no connection to nature here and all the obvious camp areas look full to capacity. 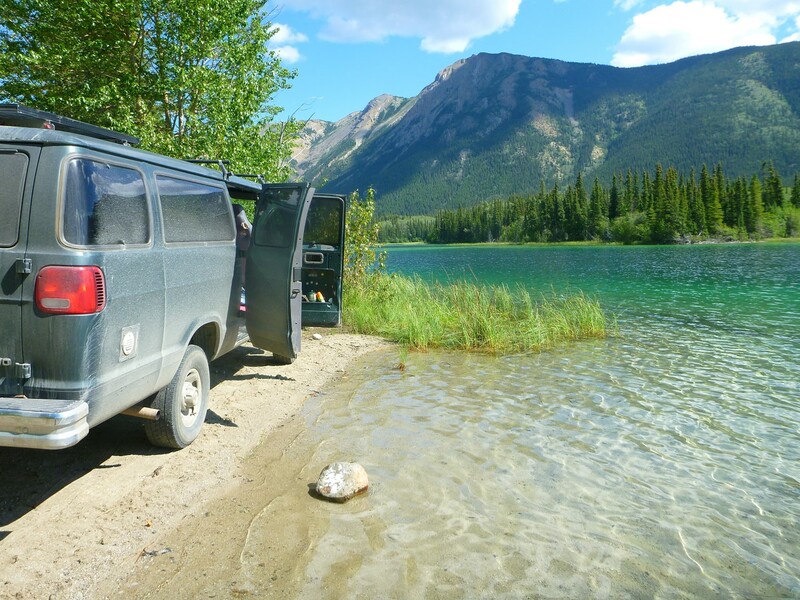 I spend a couple hours in my van next to the water making dinner, checking email and facebooking pictures and then decide to use the campground shower. I have two failed attempts at using the shower and after an eight mile hike with sweat, sunscreen and deet this is an incredibly disheartening event. First, I strip down and insert my quarters only to find out a couple of them are Canadian and the machine doesn’t accept them. No worries, I drive a few blocks to the gas station through heavy traffic to get more quarters. I return, strip again and insert the American quarters. The machine eats my quarters and the shower handle turns in all directions and doesn’t respond. The shower is broken. I wash my face in the bathroom sink and accept my fate as a dirtbag for the evening. I am spent after the eight mile hike, the bear sighting, the manic energy of the busy town of Seward and the failed shower. I drive my van for a short distance and pull into a vacant lot which happens to have just enough greenery to shield me from the road. 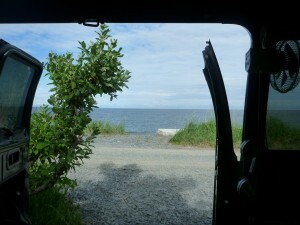 I feel grateful for this free spot so close to Seward and fall fast asleep in my van. 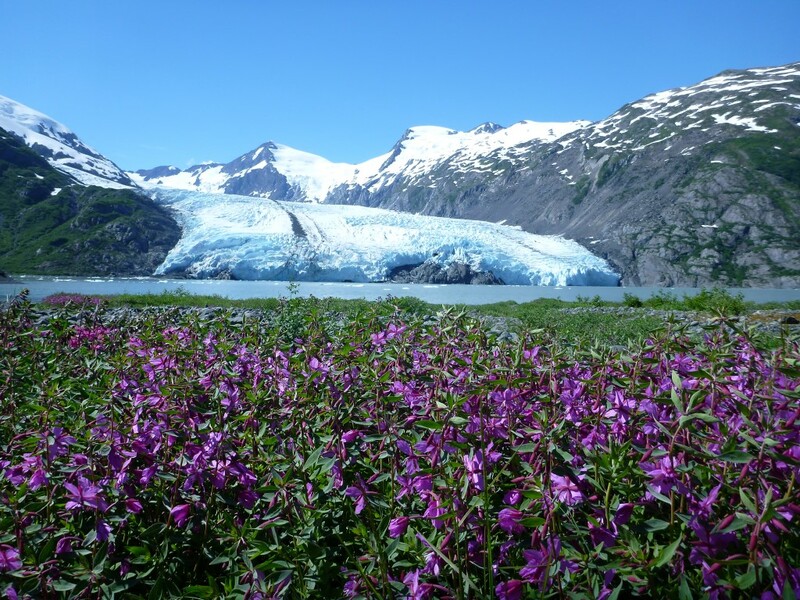 Several Alaskans who were experienced with safe practices in bear areas went to a wilderness cabin. Immediately upon arrival, they were mauled to death by a grizzly bear. 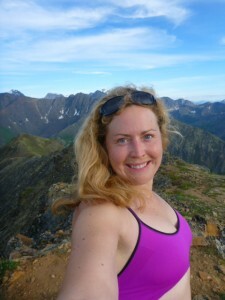 A female teacher who was new to Alaska went out for a run. She was attacked and killed by a pack of wolves. A cyclist near the Alaskan border was chased by a wolf for several miles while riding on a road. He was pedaling as fast as he could as the wolf followed close behind, biting at the pannier bags on the back of his bike. Cars passed him on the road but no one stopped. Perhaps people thought he was taking his dog out for a run. He was approaching a hill and started to panic, knowing he couldn’t possibly outpace the wolf on the hill. He swerved in front of a car to get their attention, and they finally stopped to help him escape from the wolf. One attack was pretty absurd. A man was charged by a bear right near one of the trails I hiked in the Turnagain Arm area near Anchorage. During the few seconds it took for the bear to charge, the man was able to fire 13 rounds into the bear from a semi-automatic assault rifle. That encounter was still under investigation when I left Alaska. Who carries a semi-automatic assault rifle and has it handy enough to bust out in the few seconds it takes for a bear to charge? Only in Alaska. The Alaskans liked saying “this place will kill you” with a laugh, but there was a hint of truth there. 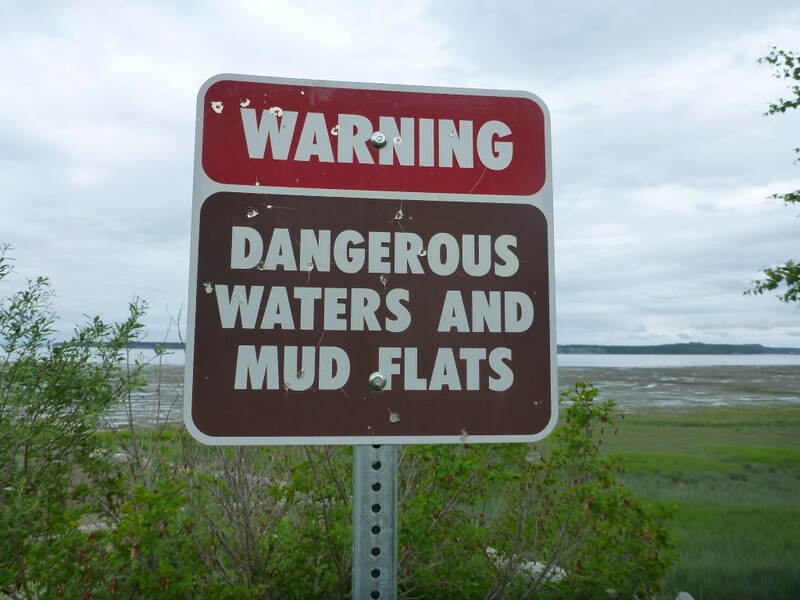 Even the beaches around Anchorage consisted of mudflats that could turn to quicksand without warning. Signs strongly cautioned to avoid walking on the beach and each year the quicksand claimed a tourist or two. 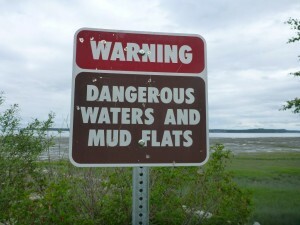 I came up with a new phrase the Alaskans loved: “in Anchorage, even the beach will kill you”. If you hear this phrase around Anchorage, it came from me. Maybe they warn us and scare us because so many people have underestimated Alaska and been smacked down. An Alaskan told me a story about a man who rented a raft, loaded his family in it and then took it down a raging, expert portion of a whitewater river. They barely survived, and when the man was questioned about why he would do such a thing, he said “there was no warning sign next to the river.” With people doing things like this, no wonder the Alaskans go a little overboard with scary tales about what could happen if we get careless. Or maybe it’s because most Alaskans who have spent time in the wilderness have also found themselves in life threatening circumstances and lived to tell the tale. I met an Alaskan who had fallen through the ice on the Yukon River and it sounded terrifying. He remembers being deeply submerged in icy water and looking up at a small spot of light where he broke through the ice. He admits he was lucky to have survived this. 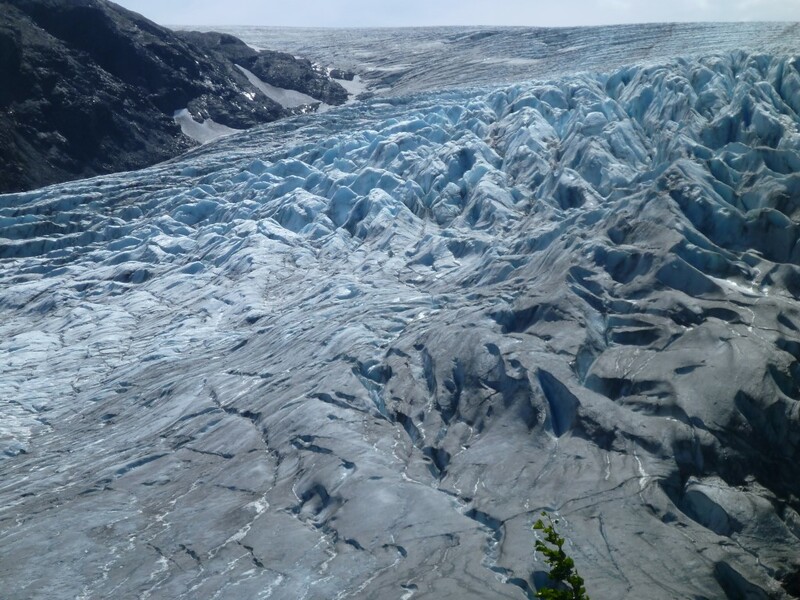 This place will kill you, and the Alaskans are telling us this because Alaska has nearly killed some of them, too. I have this habit of sleeping in my van on little side roads with great views. After three years of doing this, it finally got me in trouble. I like the quiet and solitude of these side roads. I feel safer in the middle of nowhere than I do at a campground or rest stop. I also have all I need in my van, so why would I seek out an outhouse and running water? My full sized memory foam mattress, porta potti and two 5 gallon water jugs meet my needs. I also have this habit of driving whatever road I please and not thinking much about it. If it’s a road, I can drive it with my 2 feet of clearance and 10 ply tires. Even if it’s not a road, maybe I can still drive it. I guess I was a little overconfident about my van’s abilities. The Alaska wilderness tends to smack down those who are overconfident. 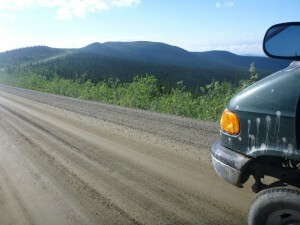 It was the evening of the summer solstice and I was driving the Top of the World road in the Yukon. The time was around 10 PM and the sky was still filled with soft, yellow, arctic light. The entire road follows a ridge line with layers of mountains on either side. Anywhere I camped would have had a great view. I started exploring the little roads branching off the Top of the World road. Some were slippery from the recent rain but I barely noticed. I just rolled around the back country, scouting for a supreme camp to celebrate the longest day of the year. Then I saw a little tan ribbon sloping gently upward to a rounded green summit, taller than anything else around. This was my solstice camp. I have a policy of investing only a mile or two in a side road. If it doesn’t look promising by then, I turn around. At about mile 1 the road turned rough but was no problem for the van. I decided to keep going and turned a blind eye to the obstacles because the van was able to drive right over them. The ruts and rocks didn’t matter. I was headed for my solstice summit. I encountered some mud that looked like nothing at all. It was a short patch of mud and it didn’t even look wet. It was the only place along the road where a bunch of small logs and steel mesh littered the side, though. Those must have been used for traction. This should have been my first clue this place had trapped a lot of people. I was confident my van could do it. I slowly pressed on right into the middle of the mud patch. The front tires spun and wouldn’t get traction. No problem. I backed up, moved over a couple feet and tried a different spot. Moving to the right two feet sank my front passenger tire so deeply into a patch of gooey tundra mud that the van would no longer move at all. I could also see that with each press on the accelerator my front passenger tire was only sinking deeper into the goo. The other three tires were on solid ground but it didn’t matter. With the one tire clutched in the mud I wasn’t going anywhere. I got out and started digging through the mud with a plastic cutting board. I didn’t even have a real shovel. The cutting board was sturdy and was pretty effective with its sharp corners. It must have been a ridiculous sight for any animals watching me from their hiding spots. Clouds of mosquitoes tried to bite through my special mesh shirt as I dug vigorously among the bright green tundra plants with my plastic cutting board at midnight. I didn’t lose my composure, but I was afraid. Really afraid. I didn’t understand how this mud trapped me so quickly and so completely. It had looked like nothing at all. Were there other threats I just had no clue about, waiting to smack me down? My whole sense of confidence about the trip felt shaken. I persevered with my plastic cutting board and freed my front passenger tire from its wet, muddy cocoon. I put branches under the tire and propped logs behind it, but the tire just spun helplessly no matter how much wood I placed around it. All I needed was a little push to get me onto the logs, and it would have been an easy downhill push at that. Now that the tire was dug out, all I needed was a push to get the tire moving while I pressed lightly on the gas. There was absolutely no way to hit the gas and push the van at the same time. That was the most frustrating part about this ordeal. I felt helpless. A small problem had suddenly become a crisis because I was alone. Why did I do this drive alone? Why, why, why? Would anyone even come up this road tonight to help? The Top of the World road is already incredibly remote, and then I took a side road to get even more remote. What sort of person would show up and would they be helpful or creepy? Whoever showed up would find out I was by myself with no way to escape. I couldn’t let worry take over. I just had to trust that things would work out. A good person would help or give me a ride to cell service. I could pay money to retrieve my van, although as far as I was from services it was hard to imagine the bill I would incur for this. At midnight the light was still streaming in the windows of the van. I needed to get some sleep. I put up my blackout curtains and tried to get comfortable on the bed with the van pitched toward the right. I propped myself up with several pillows and started to form a plan for finding help. It would be safer to ask for help during the day so I decided to stay here for a few more hours. If no one came by morning I would walk down to the Top of the World road around 10 am and try to flag down a big pickup truck. I would hope to find a burly truck capable of navigating this road, with a driver willing to help with a stranger’s muddy mess. I realized this was a lot to ask and I would need to find a person with a heart the size of the entire state of Alaska. It was difficult to sleep because I felt the constant urge to get out and dig more to try to get free. It was hard to admit that I couldn’t do anymore to fix this. The more I spun the tires trying to get free, the lower the van sank. The front axle was already lightly touching the ground. I would only make things worse if I drove the axle into the mud. I finally slept a bit and had euphoric dreams of rescue. I awoke and wondered if this was really happening. Yes, I was still sleeping on a severe incline in the middle of nowhere. It was really happening. Back to sleep. I heard dogs barking in the distance. Back to sleep. Finally the restless night was over and I gathered my valuables in my backpack and began the “walk of shame” down to the Top of the World road. My tail was tucked and it was time to admit I underestimated the Alaska wilderness. Immediately I noticed fresh wolf tracks on the road and I remembered waking to the sound of dogs barking last night. I realized those were wolves and they probably traveled this road last night to investigate my van. I was completely on edge. I had to talk myself through the entire 30 minute walk to the road. Ok, 20 more minutes to go before I was at the road and near other people. OK, now only 5. Almost there. I tried to sing to calm my nerves. I recalled my plans to hike solo during my trip. How can I possibly hike solo in Alaska if this 30 minute walk inspires this much terror? I reached the road and saw a truck pulling a fifth wheel camper. I didn’t even care it wasn’t the type of truck I envisioned for a rescue. I flagged them down and started rapidly describing the events and asked what they thought I should do next. I probably sounded like a crazy person. They said they would give me a ride to the border so I could call for help. These people represented safety, which I had craved for the last 12 hours. I didn’t want to hang out on the side of the road with the wolves until the right truck came along. I looked at the clean interior of their truck and kind faces. Everything I saw looked so very safe and comforting. I got in. They were travelling with another couple. 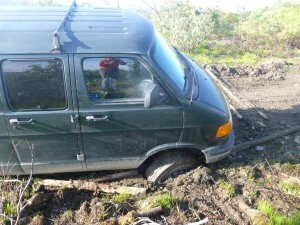 When we all met up a couple miles down the road I described the situation and showed them pictures of the stuck van. They said it didn’t look so bad. They started to look for tow straps and unhooked the truck from their trailer. It was a smaller truck but maybe it could navigate the road. 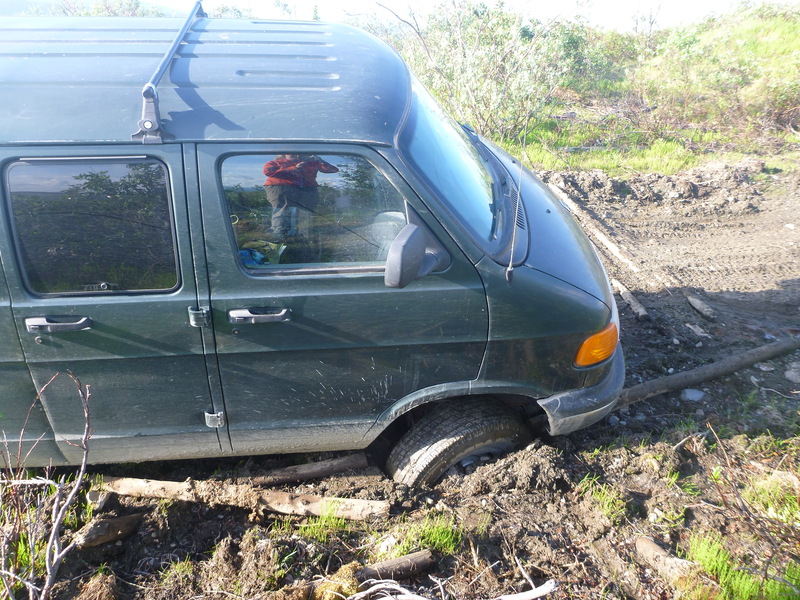 If we could reach my van there was a good chance we could free it from the mud. I just felt ecstatic to have found someone who would even try at all. We started up the road and the first mile went smoothly. When the small truck hit the first rough spots we got nervous and almost turned around. They said they had no idea why I would drive this terrible road by choice, why it even existed in the first place, and I needed to have my head examined. I heartily agreed with all statements. They pushed past the terrible obstacles on the road and we finally arrived at my trapped van. We connected webbing from the front of their truck to the rear bumper of my van and I got behind the wheel to gently give it gas. With just a little tugging the tire was freed from its cauldron of mud and now my ecstasy could not be contained. I got out, saw I was free and started jumping up and down with happiness. Thank you! I yelled to them and threw my hands in the air with delight. I wasn’t stuck anymore and could drive out of here without paying for a rescue. Ecstasy. I felt so grateful. I offered money but they refused, so I grabbed a copy of my Idaho Canyoneers book and wrote inside: “To my Top of the World angels, may you receive 10x the blessings you have bestowed upon me. Much love, Lisa.” What else could I have done to show my gratitude for the kindness of these strangers? Now, when they tell the story about the woman from Idaho they helped out of a jam, they have photographic evidence. 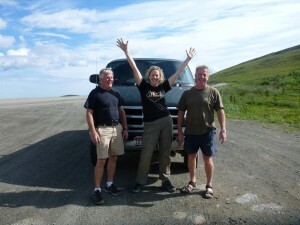 We made it back to the highway and posed for photos together by the van. This rescue would be a treasured memory for all of us. As I rolled down the road away from my angels, I felt so filled with gratitude I hoped I would have the opportunity to help someone else along this road. Usually helping someone is just an impulsive act when the need arises, but today I really wanted an opportunity to pass on the kindness I just received. About 30 minutes later, I got my chance. I passed a group of bikers clustered around a motorcycle. I pulled over and saw they were working on a flat tire. The tire had been patched but the patch wasn’t holding. There’s nowhere to get a tire out here and the owner of the bike looked concerned. I happen to have a lot of supplies for fixing a tire and surely this big group of bikers will know how to use them. I was excited to help and started grabbing my repair items. The first thing I produced from the van wouldn’t work on a motorcycle, but the second thing I produced was a true motorcycle tire repair kit. I’m not sure why I chose it several years ago at Walmart since I’ve never even owned a motorcycle, but it rode around in my van until the perfect moment arrived. I presented the kit to a very happy recipient, and after chatting with the group for about 10 minutes the tire was fixed and holding air! Now this new friend with the previously flat tire had the same light in his eyes that I had earlier. Maybe he felt the same swelling in his heart that comes from a total stranger seeing your distress and caring enough to solve your problem. He wanted to pay me for the kit but I said, “no, that’s ok”, and I told him what happened to me earlier that day. He was all smiles. He rode away on his bike and I rode away in my van. What could have been the lesson in all this? We may try to be self-sufficient but some problems just cannot be solved alone. This realization up on the tundra in the mud shook me to the core, but it also forced me to trust in “people helping people”. This is probably the best thing to trust in, anyway, and it provides more protection than control and planning ever can. We’re never really in control of our own safety, anyway. The day started out with some unexpected excitement. 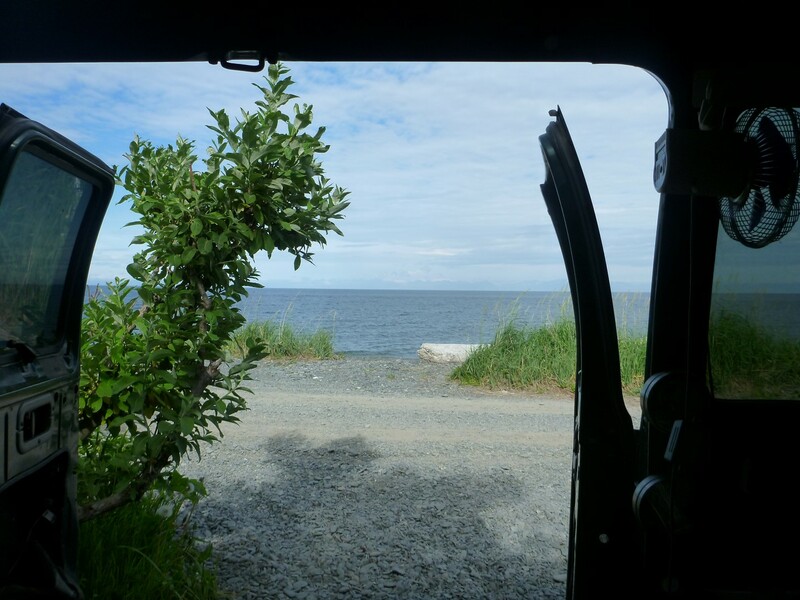 I woke up in my van in a large parking lot next to the ocean in Whitter, Alaska. I started working and my director asked me to call him so he could walk me through some complex statistics and charts on a website. When I’m using my cell phone to tether to internet I can’t call anyone and if they call me the connection is lost. My cell phone can either function as a phone or internet hopspot but it can’t be both at the same time. I drove into Whittier and searched for wifi unsuccessfully for about 30 minutes, then finally paid $4.99 for an hour of internet and made my phone call. I felt relieved to have been close to wifi when I needed it. I always try to be extra responsive when travelling in remote areas. My responsiveness and commitment to my job are my number one priority while travelling. This is what makes this lifestyle work over the long term. I would hate to inconvenience my co-workers by being slow to respond and then be told by my employer that I need to make my way back home and be more serious about my professional commitments. I worked for several hours and started the Portage Pass hike around noon. The first part of the hike was on a wide trail which was easy and touristy. All the people I met on the hike were just out for the afternoon from the cruise ship. 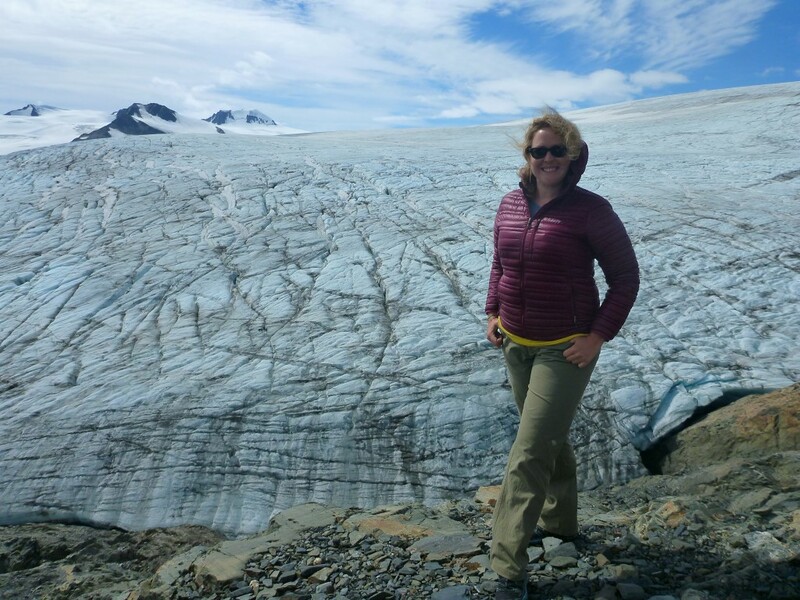 I climbed to the top of the pass and enjoyed a nice view of Portage Glacier from afar. Apparently this is as far as the cruisers go, because from here down to Portage Lake the trail became a faint path which was sometimes hard to follow and I got sidetracked a couple times. At one point I hiked along the side of a small gorge on a game trail which eventually disappeared, then I had to climb all the way back up the gorge. Once I was sure I was finally on the right path due to the regular presence of cairns, I saw huge moose tracks. I almost turned around at that point. I hadn’t seen anyone since the pass and was feeling nervous about the wild nature of the trail. It was hard to follow and there were no signs to provide reassurance. I’ve been trying to keep my solo adventures gentle, and I questioned myself if this was getting a little too adventurous. I felt like I was on the edge of my mental and emotional comfort zones, but probably not in physical danger so I pressed on. I called out “hello” at least every couple minutes to alert the animals of my arrival. I imagined a moose ready to charge around every brushy corner. I had to talk myself through the entire descent to the lake, reminding myself how much I wanted to reach the lake, how close it was, and how small the probability was of seeing an animal. I felt victorious when I reached the gray sand of the lake shore and stood at water level near small and large floating ice burgs. 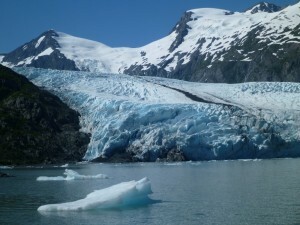 I got to see car-sized chunks of ice calve from Portage Glacier and fall into the lake with a big splash. For the hike back out, I went as quickly as possible to minimize the time I would feel nervous. I hiked at high speed all the way back up to the pass and probably set a new speed record for myself. It’s up to each of us to decide what our own personal Everest is and to engage fully with that challenge. 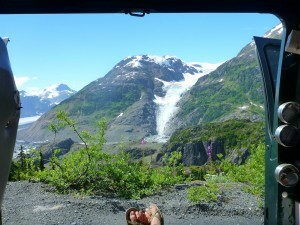 That day, it was an easy 5 mile hike to see a beautiful lakeside glacier.